How to change ownership of the contact to another team member? 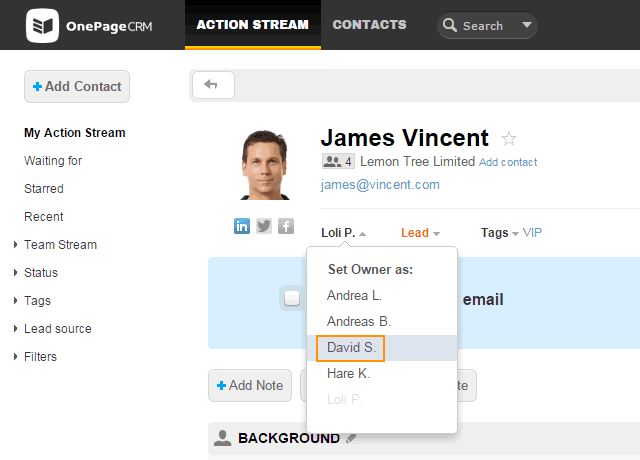 Multiple user plans allow all team members to share information on all contacts but also to change the ownership of contacts from one user to another. Select all contacts by checking the bulk selector box or simply select individual contacts by checking the box beside a contact. In the bulk menu, open the Owner tab → choose a name from the Set Owner to dropdown whom you wish to give contact ownership too. Open a contact in Contact View → Click on the current owner below the contact details. In the Set Owner as dropdown, click on the new owner. Current contact owner and the new contact owner will be notified by email about the update. Next Action and Queued Actions of the old owner are re-assigned to the new owner. If the contact already has a Next Action with the new owner, the newly assigned Next Action is listed as Queued Action. How to view other team members' contacts?